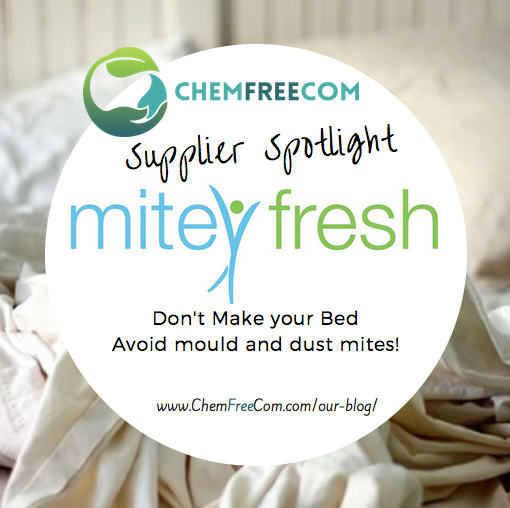 Don't Make your Bed – avoid mould and dust mites! 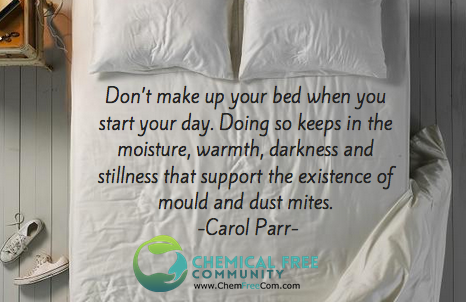 Don’t Make your Bed – avoid mould and dust mites! Is your home or office making you unwell? Are you suffering from headaches, dizziness, nausea, fatigue, eye and skin irritation? Your environment contributes to your health. So who do you call for help, a Building Biologist! It could be poor ventilation, airborne particles like dust, carpet fibres and fungal spores, chemical pollutants from cleaning materials, furniture and printers or poor lighting. Building biologists to the rescue. 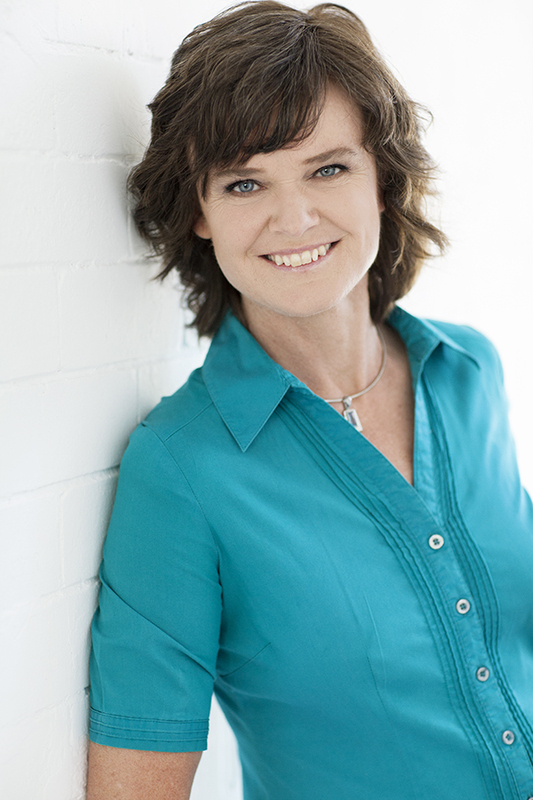 Meet one of our Chemical Free Community members Carol Parr. Our focus is to give homes and families a wonderful atmosphere of health and cleanliness by searching and removing environmental triggers from beddings, carpets, lounges – spaces where people sleep, play and work to help them breathe easier, live easier. As a Building Biologist, I physically attend a home or workplace. I assess the occupants’ indoors and outdoors, look at all elements in their environment like dust, mould, dust mites, chemicals, pets, a whole range of different pollutants and pathways as well as ventilation, heating, Wifi, EMRs and so on. And by really understanding their environment, I can get to the root cause of what is potentially creating the problem. I then recommend solutions to eliminate or substitute those issues so that the problem doesn’t occur. Working as a nursing sister I found doctors prescribe medications to patients without really taking the time to talk with them in order to fully understand the latitude of their health and their environment. I felt that not every potential symptom means that medications have to be swallowed. Simply, they indicate there’s something adverse either in the body or in the environment. That something needed to be diligently sought out and addressed which led me to establishing Mitey Fresh. Ultimately, what I’m trying to do is work in conjunction with doctors because they don’t have the option to be able to go into their patient’s home and see what’s going on for them. I help doctors get the best outcome for their patients. All in all, as a Building Biologist I help people embrace a holistic relationship between the natural and the built environments and their occupants, ensuring sustained health for individuals, especially the children, and the environment. One of my most interesting tips for creating a healthy environment for you and your family is “Contrary to your mum’s advice, don’t make up your bed when you start your day. Doing so keeps in the moisture, warmth, darkness and stillness that support the existence of mould and dust mites. 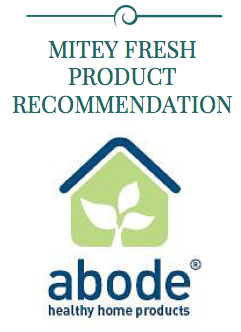 If I were to recommend another company that is helping make the home a healthier place to live in, I’d recommend Abode cleaning products. Abode was founded based on the realisation that the home had become the basic cause of most of the illnesses found in patients. They provide the best home cleaning products made with natural ingredients without the nasty chemicals present in most other cleaning products. Want help with your health, home or office, read more about Carol and Mitey Freshes’s services and products. Looking for amazing chemical free home cleaning products go to Abode Healthy Home Products. Carol Parr, qualified Building Biologist, and husband, Tony, own and manage Mitey Fresh, a company founded in 1996 out of the passion to help people suffering from asthma and allergies.